In this groundbreaking book, two leading authorities in the field review what we really know about how and when the brain learns, and consider the implications of this knowledge for educational policy and practice. Sarah-Jayne Blakemore is a Research Fellow at the Institute of Cognitive Neuroscience at University College, London. She is engaged in neuroscience research, for which she obtained the 2001 British Psychological Society Award for Outstanding Doctoral Research. She has been seconded to the Houses of Parliament to write a report on Early Years Education for Select Committee for Education. Her involvement in the Public Engagement with Science is demonstrated in her frequent public lectures and scientific consultancy on a major BBC series on the Human Mind. Uta Frith is Professor of Cognitive Development and Deputy Director of the Institute of Cognitive Neuroscience at University College, London. She has researched developmental disorders for more than 30 years. She is a leading authority on autism and dyslexia and has gained prestigious prizes and honorary doctorates. She is the author of well known books on autism and Asperger syndrome. Her work has led to greater awareness of disorders of cognitive and social development with a basis in the brain. 3. Words and Numbers in Early Childhood. 6. Learning to Read and its Difficulties. 7. Disorders of Social-Emotional Development. 11. Different Ways of Learning. 12. Harnessing the Learning Powers of the Brain. "This beautifully written book by two experts is compelling reading for anybody who wants a clear, authoritative account of how our brain learns. It will enthrall the widest possible readership - those people who have no previous knowledge of brain science, and those who have a detailed grasp of how the brain works." "This is an exciting, readable and compelling account of how the workings of the brain shape both formal and informal learning." “It [The Learning Brain: Lessons for Education] is rich with facts, yet easily accessible to the general reader. While sending a positive and encouraging message about the relevance of neuroscience to the classroom, its tone is responsible and not exaggerated. The book is packed with details of cutting-edge research, presented in a lively manner with care to avoid excessive detail. "The material is well presented, and much of it is fascinating in its own right. Anyone interested in the workings of the brain can profit from reading this book." 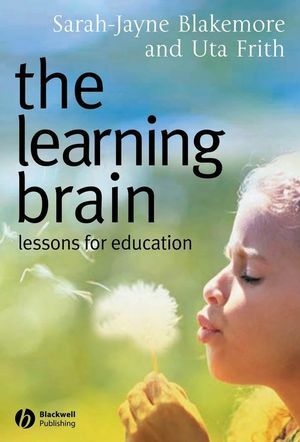 "The Learning Brain should become compulsory reading for everyone who is involved in educational practice and policy because it by no means raises unrealistic hopes, or – like some other popular books in this field – give more or less trivial advice about ‘brain-appropriate’ learning. It also helps in the understanding of what might have gone wrong in the brains of learners who, for example, have persistent reading difficulties despite schooling, or who fail to grasp advanced mathematical and scientific concepts." "This is a very readable account of the findings of brain research and will appeal to a wide variety of readers . . . Readers, whether they be members of the general public who have an interest in how the brain works, people working within education or new researchers will be amazed by the findings of brain research and will want to find out more." looks at what we can learn from brain research about children with learning difficulties, and how this can inform remedial education.